Human serum albumin (HSA) is the most abundant protein in the plasma. HSA plays a central role in drug pharmacokinetics because most drugs bound to HSA are delivered to their target organ/tissues. The prodrug strategies have shown great promise for improving the activity and selectivity of drugs. Designing prodrugs based on special HSA residues, such as Cys34 and Lys residues, has been extensively studied. 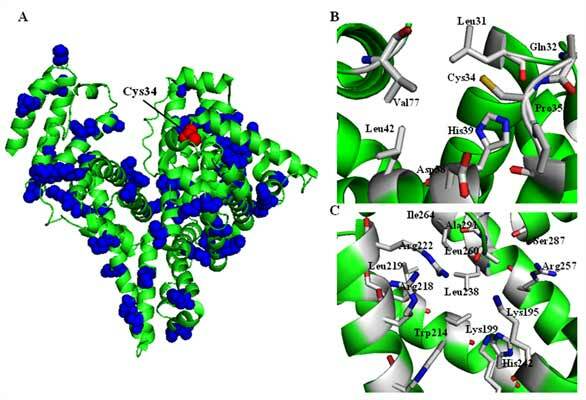 Therefore, this review provides an overview of the development of nonsteroidal anti-inflammatory and anticancer prodrugs based on these special residues. In conclusion, this review may guide the rational design and development of new prodrugs for future clinical applications. Human serum albumin, Prodrug, Drug design, Protein structure. 15 Yucai Road, Guilin, Guangxi, China. Zip code: 541004.